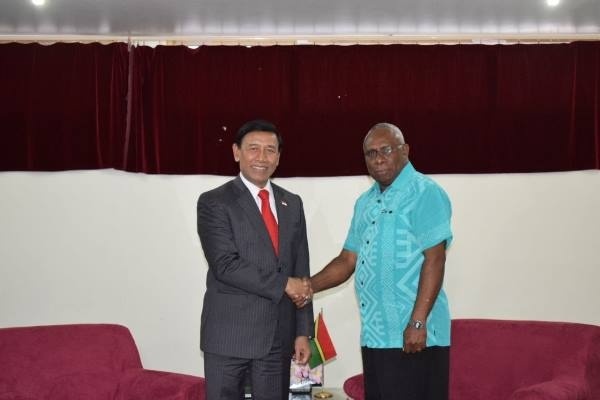 Reported by papuanews, responding to the issues that were discussed in the main Pacific countries of Vanuatu related to Papua, Coordinating Minister for Political, Legal and Security Affairs Wiranto discussed the cooperation between Indonesia and Vanuatu related to the economy and capacity building between countries. He also explained to the Vanuatu, Indonesia is not possible to oppress the Papuan people. "Before leaving I got a message from the President to improve the cooperation that has been built, especially in the field of economy and capacity building," said Wiranto, Tuesday (30/1). He delivered this during a bilateral meeting with President Vanuatu Tallis Obed Moses. On the same occasion, he explained about the history of Indonesia, which was long occupied by the Dutch and Japanese. Therefore, he said, the Preamble of the Constitution of the Republic of Indonesia (UUD RI) 1945 affirmed, Indonesia recognizes the independence is the right of all nations, therefore the colonization of the world must be abolished because it is not in accordance with humanity and justice. "On the basis of that Indonesia always wanted to establish cooperation for developing countries like Indonesia and Vanuatu to be apart from the colonization of new models. Indonesia always wants cooperation, not push each other but need each other, "he said. There Wiranto also held a bilateral meeting with Prime Minister Tuvalu Enele Sopoaga. He also convey things that are not much different about the history of the Indonesian nation. According to him, Indonesia has a long experience as a colonized country. "Therefore, the Indonesian philosophical concept says that independence is the right of all nations, all forms of colonialism should be abolished. It is impossible for Indonesia to oppress friends in Papua, "he said. On the contrary, Wiranto continued, the government continues to strive to develop Papua in line with other provinces. There he also provides a complete picture of the latest development process in Papua and West Papua. Development is intensified by the government of President Joko Widodo (Jokowi). "We also invite the leaders to see first hand the situation of Papua and West Papua. So by looking directly, I think it can change perceptions built by other parties if we neglect Papua and West Papua, "he explained.